Police are disputing allegations made by a teenager who claims she was a victim of brutality while resisting arrest in Alert Bay. The 17-year-old, who cannot be identified under the Youth Criminal Justice Act, told The Province she was walking home with her boyfriend Thursday when two RCMP officers stopped them because they were drinking. The couple were under a court order not to contact each other. The boyfriend was taken into custody, but when the girl resisted arrest, one of the officers punched her twice, she said. The girl said she “blacked out” after the second punch and woke up struggling with police in a jail cell. After she was released from custody Friday evening, she posted photos of her injuries to Facebook, which have since been shared thousands of times. 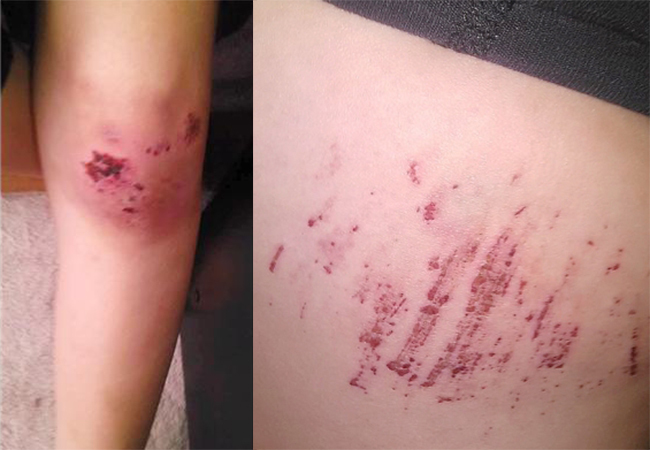 In the photos, she appears to have a black eye, a swollen nose, scrapes on her legs, and bruises on both wrists. A 17-year-old Alert Bay teen says she was walking home with her boyfriend on Thursday when two RCMP officers tried to arrest them for breaking a peace bond. 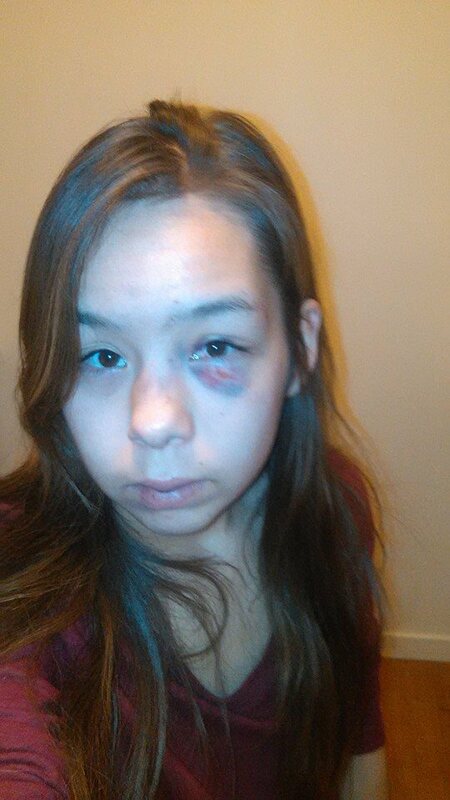 She says she was punched twice by one officer after she bit him while resisting arrest. Photograph by: Submitted Photo , Facebook. Sgt. Rob Vermeulen said RCMP are prohibited from identifying youth who are alleged to have been involved in crime, but he said an Alert Bay RCMP officer was dispatched to a violent domestic incident Thursday involving two people well known to police. Vermeulen said several charges are being recommended to the Crown. “My understanding is both are known to be violent and both were allegedly intoxicated and fighting,” Vermeulen said. “The police officer was allegedly bitten three times by one individual, which broke the skin. He was also kicked in the head. Another member arrived and both young people were ultimately arrested and held in cells for bail hearings. While in cells the other police officer was allegedly kicked in the groin by one of the suspects. Vermeulen said the officer who was bitten was taken to hospital and will be fine, while the other officer was not injured. The girl said she is in contact with a Vancouver lawyer and is pursuing charges against the constable she alleges injured her. The girl’s stepfather said police told him his stepdaughter had kicked an officer in the groin, kicked an officer in the head and bit an officer twice. When the stepfather went to get her at the police station, she had a black eye and swollen nose, he said. The stepfather said her behaviour is “a new thing” that came on following the death of a close family member three years ago. He said he hopes the officer will be disciplined for his handling of the arrest. Vermeulen recommended that anyone who feels they have been mistreated by an RCMP member call the detachment and the RCMP’s Civilian Review and Complaints Commission. Posted on January 12, 2015, in State Security Forces and tagged Alert Bay, Kwakwaka'wakw, Namgis, RCMP. Bookmark the permalink. Leave a comment.